← The Nov. 2 mushroom hike was a hit. The Department of State Lands is considering a proposal to sell three tracts of the Elliott State Forest to private bidders. The Elliott State Forest is comprised of 93,000 acres of forestland east of Coos Bay and Reedsport. The Elliott has been the focus of an ongoing dispute over forest management practices. Close to half of the forest has never before been logged, and is home to endangered species such as the marbled murrelet, northern spotted owl and coho salmon. Currently, an injunction from a federal judge halted many of the Oregon Department of Forestry’s recent timber sales due to a lawsuit filed by conservation groups contesting that the ODF was planning timber sales in occupied marbled murrelet habitat. The marbled murrelet is a potato-sized seabird which nests on large branches in old-growth trees within fifty miles of the ocean. During the nesting season, the birds commute to the ocean to fish and return to their branches to feed their young. Through the timber boom in the 1900s much of the suitable habitat along the Oregon coast was harvested. The Elliott offers an important refuge for these imperiled birds. After the murrelet was listed under the Endangered Species Act in 1992, stands of trees occupied by the birds have federal protection. Since their listing 21 years ago, their populations have continued to decline. A decade-long study by the Washington Department of Natural Resources released in 2010 reported the annual population decline in the U.S. At 3.7% annually. The Department of State Lands publicly announced the intent to sell 2,714 acres of the Elliott State Forest this June. The first appraisals about the sale parcels were released last week, a scant four days before the public comment period ended. These timber appraisals compile market analysis, timber cruising reports and relevant data about threatened and endangered species. Surveys of the area give detailed descriptions of the parcels, highlighting tracts of never before logged stands; places where hundreds of contiguous acres still remain intact. The three parcels up for sale are very diverse. They include stands of trees up to 300 years old, marsh and grasslands as well as younger stands of conifers and hardwoods. This past summer a group of concerned Coos County residents formed Coast Range Forest Watch to conduct ground surveys for marbled murrelets in the Elliott. It was apparent that the unsurveyed area was mature potential murrelet habitat; likely being used by murrelets for nesting. In late July, Coast Range Forest Watch surveyors discovered that one of the areas proposed for sale is occupied by murrelets. State surveyors also documented murrelets in nearby areas of the sale parcel. 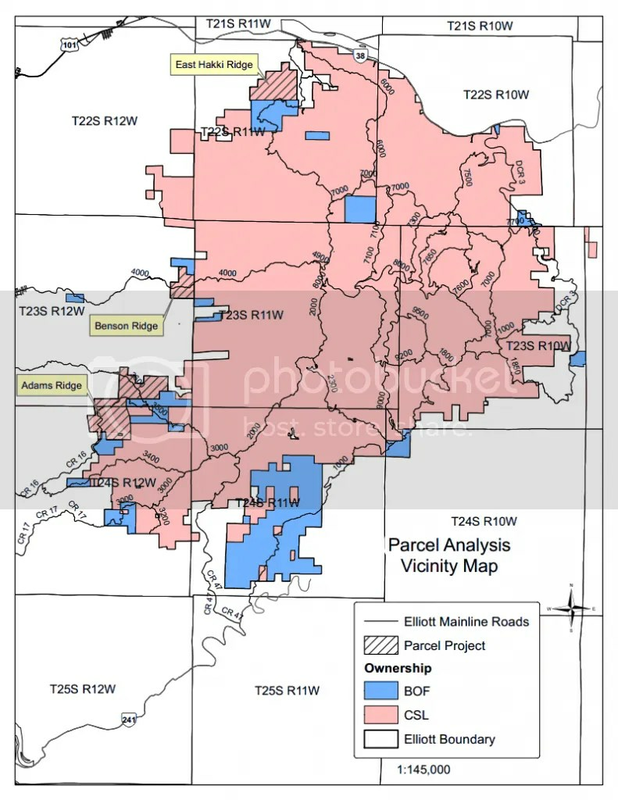 The map below is of the Adams Ridge parcel, red blocks are results from state contracted surveys and blue are result from Coast Range Forest Watch surveys. The 1,500 acre area in question, called Adams Ridge, is in the southwestern corner of the forest. The DSL appraisals, performed by Tigard-based Northwest Forestry Services, concluded that 1300 acres (82%) of the area is occupied or likely occupied by murrelets. The other two parcels of the DSL sale, Benson Ridge and East Hakki Ridge, also contain large portions of suitable murrelet habitat, but have not been surveyed to determine whether murrelets are actually nesting in the area or not. In the appraisal, an ODF biologist reported the chance of finding a murrelet in an unsurveyed stand in the Elliott is 50%. However, the same biologist also said these parcels are the first large block of mature forest that a murrelet will encounter coming from the ocean, making them a good candidate for breeding habitat. In total, three quarters of the 2,700 acres is suitable murrelet habitat and would likely be restricted from harvest by the federal Endangered Species Act, although nearly half of these 2,049 acres of suitable habitat have not been surveyed. The possibility of finding murrelets on these parcels presents a risk most timber operators aren’t willing to take. In conjunction with these findings, the appraisers conducted interviews with interested parties and regulatory agencies. Timber industry representatives expressed that they were not interested in aggressively pursuing the Adams Ridge sale due to the murrelet presence. In fact, most of the eight potential purchasers thought that a 100% discount would be appropriate on the parcels. You read that correctly, timber industry representatives concluded that Oregon Department of State Lands might consider giving away thousands of acres of the Elliott State Forest. All potential purchasers expressed that stands occupied by murrelets receive no appraisal value, and that stands of suitable unsurveyed habitat should be heavily discounted. These reductions dropped the appraisal value nearly tenfold; from $22 million to roughly $3.6 million. Transferring these lands to private ownership has significant environmental consequences. Timber representatives questioned whether the federal laws would be enforced, implying that a purchaser may be able to get away with illegal logging without punishment. It turns out their question is warranted. Kevin Maurice from the US Fish and Wildlife Service, the agency charged with enforcing the Endangered Species Act, indicated in the report that the agency “often does not pursue violators, even when the agency is aware of a violation.” It is unfortunate that the USFWS declines to do their job in these situations. This admission underlines the need for public monitoring of timber projects in the region. These forestlands also serve as hunting, fishing and recreation areas for Coos County residents. If transferred to private ownership people in the area may not be allowed to use them for these purposes. There are economic impacts of this potential transfer as well. Nearly all timber harvested from public land is banned from export, a rule made to keep milling and manufacturing jobs here in Oregon where the timber came from. The ban does not apply to private timber, meaning the vast majority of timber felled from these parcels would be shipped overseas raw, costing Oregonians precious milling jobs. The State Land Board is reviewing the proposal to sell 2,700 acres of the Elliott State Forest, including the 1,600 acre Adams Ridge parcel, on December 10th. 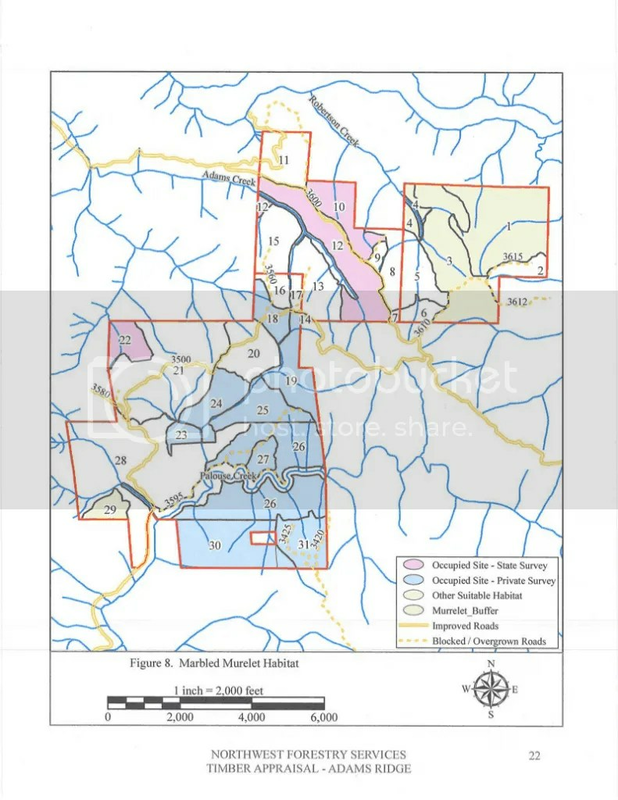 With the timber industry showing little interest and the legal implications of such an extensive marbled murrelet presence, the board will have to face the fact that these properties may be better conserved in public ownership than auctioned for pennies on the dollar to private interests.